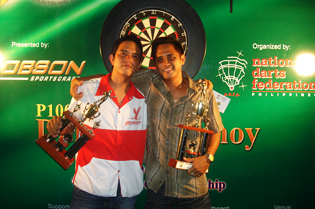 The Philippine Team led by Christian Perez, of Robson Sportscraft, NDFP top ranked player and the only Filipino in the PDC Order of Merit, will be joined by Lourence Ilagan, the NDFP 2nd ranked player as the Philippine representatives to the PDC World Cup of Darts, in Hamburg Germany on February 3-5, 2012. The Philippine Team is seeded 22nd in the 24 countries invited to the World Cup. The Philippine Team will face 11th seeded Team USA of Darin Young and Gary Mawson in the best of 9 legs 501 Doubles in the 1st Round on Friday, February 3, 2012. (9PM local time). Should they win over USA they will next face Germany in the 2nd round and on tap in the 3rd round or the Quarter finals will be England of Phil Taylor and Adrian Lewis. Watch out for posting of live streaming links on JustinTV at the NDFP forum 1 hour before game time on the day of the event. For complete details check out the PDC link. copyright 2005 - 2012 www.ndfpdarts.com All Rights Reserved.